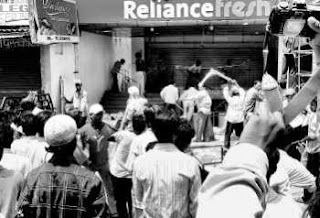 Ranchi: Petty traders and vegetable vendors on Saturday vandalised three of the five Reliance Fresh food outlets here, feeling threatened by the modern retail chain. Around 200 people barged into the stores, which sell grocery, fruits and vegetables and smashed glass panes and pulled down the shelves as the Reliance Fresh staff ran for cover. A retail outlet at Lalupur Chowk was the first target, followed by one near Tagore hill and another near the Plaza cinema here. City Superintendent of Police Richard Lakra told PTI that the protesters pelted stones at the stores injuring a constable, when the police tried to stop them near the Tagore hill shop and also attacked and damaged passing vehicles. Reliance Retail officials, however, declined to comment. The police had to use `mild force' to quell the mob, which was joined by people from the weekly haat at Tagore hill, Mr. Lakra said. According to unofficial reports six people were injured in the police action. After the violence, all the five Reliance Fresh shops downed shutters with the police standing guard. Recently vegetable vendors and small retail shop-owners had demonstrated against the opening of Reliance Fresh outlets in Jharkhand, accusing the private sector of directly affecting their business. In West Bengal, Forward Bloc leader and State Marketing Board Chairman Naren Chatterjee said the company could face similar action if it went ahead with plans to open stores in the State. "If small traders are affected, the reaction may be violent," he said.